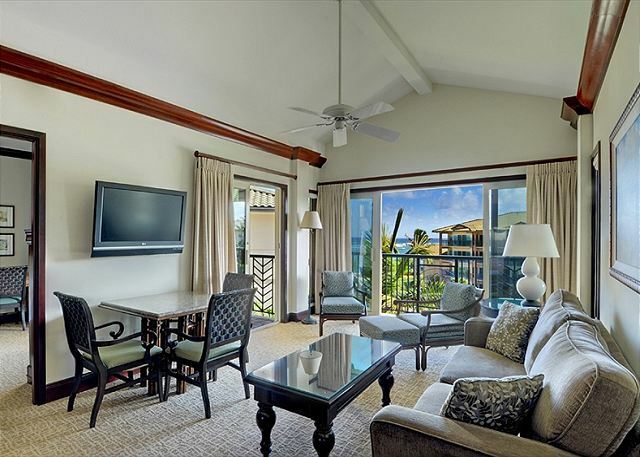 One of Waipouli Beach Resort’s best Ocean View penthouses, this fourth floor suite fronts the ocean and torch-lit interior courtyard. 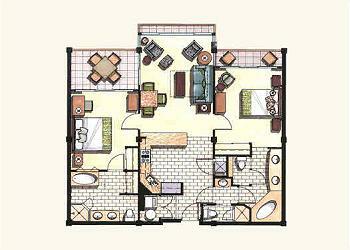 Two bedrooms and a sleeper sofa can accommodate up to 6 people, although 2-4 is recommended. Worthy of a honeymoon, this suite is a guest favorite. Clean and tasteful interior design by renowned Philpot’s and Associates is complemented by stunning sea breezes and sunrise skies from the private lanai. 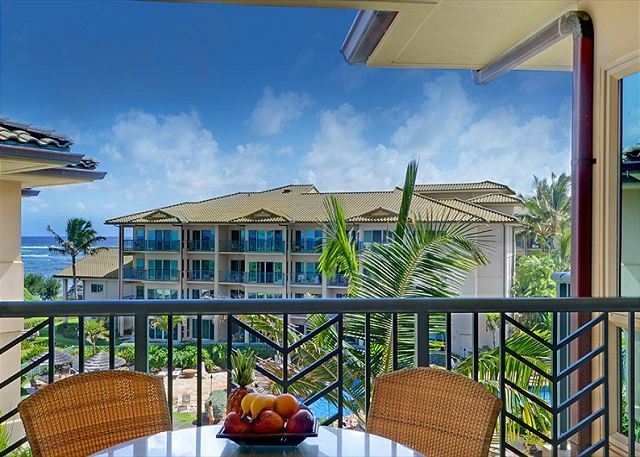 Enjoy the luxurious amenities and convenient location, with the beach and boundless Kauai adventures just beyond your lavish tropical hale. Worth every penny & just as described! I would rent this unit again and it was just as expected - clean, well stocked, centrally located, and plenty of amenities. The kitchen was well stocked and there were plenty of extra items like clothes hangers, beach mats, and even toys for the kids. The linens all appeared new and the beds/pillows were comfortable. One tip for future renters - the street light at the entry to the complex can be very slow to change if you are trying to make a left turn out of the complex. Consider making a right out of the complex and a u-turn further North on the highway. Also the closest elevator was in Building C and then you walk across the fourth floor to Building B. Overall it is a great unit, nice complex, and a wonderful experience ! Overall, we were very pleased with our stay in B404. The condo easily accommodated us and our two kids (12 & 9). Everyone had room to spread out, the bathrooms were very nice, laundry machine was efficient, and the kitchen was well appointed. We did have a lot of trouble with the exclusive took 3 days before they were able to get it up and running for us...finally following the solution we suggested the first day. Kudos to Sheri, she was very responsive. Beyond the condo, the pool is amazing. The beach on the property was not inviting but we just went to other beaches on the north and south shore. Very convenient location if you are traveling all of the island. Would stay here again. Beautiful resort! We stayed in B404 Pool/Ocean penthouse. The rooms were spacious and clean. We arrived a couple of hours early and were allowed early access. The unit was well furnished and equipped with everything we needed for the week. Location was perfect. Easy access to stores, restaurants, beaches and activities. Downside. Poor wifi, a disappointment for the kids. This Unit is gorgeous!! The view fantastic and the amenities are a plenty. I have no complaints and look forward to a longer visit next time !! Very comfortable place. Beds were very good and kitchen equipped very well. We loved the Margarita Machine! Great view from the 4th floor. Only thing to complain about was the noise from AC or Kitchen unit outside patio. The pool and grounds are beautiful. Very modern building. Absolutely wonderful in every way and detail. Over the top in amenities and comfort. We travel the world and have stayed in many places and this one is at the top of the list.Location and convenience were also over the top with grocery stores and restaurants across the street!The biking path that was safe and easy access was a big plus, especially with the bike rental on property. The pool complex and beach area was perfect and gave a nice variety of fun (with water slides) and relaxation for everyone. Quick response at all times from management gave us a feeling of comfort as well. Thanks! Our family of four loved this penthouse, plenty of room for all. 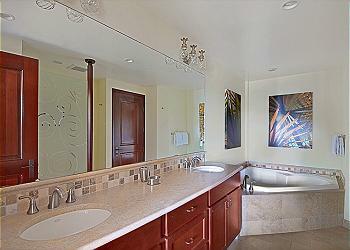 The whole place was well maintained and well appointed with high end appliances and furniture. I love to cook, and I found that the kitchen was quite well equipped. Having two grocery stores and coffee shops, even a McDonald's across the street was quite convenient. 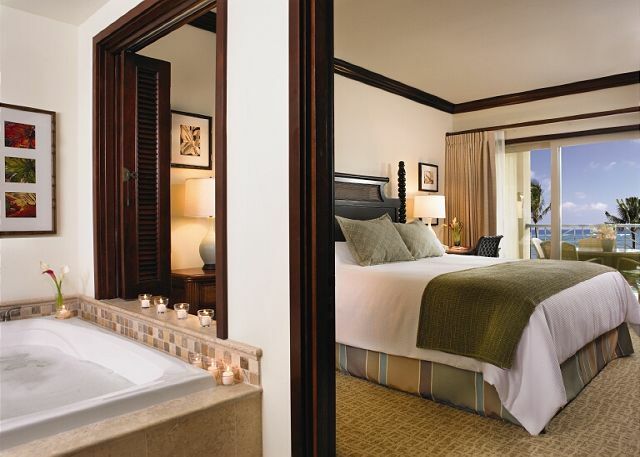 Kauai Exclusive Management was wonderful to work with; we definitely will recommend this room, this resort and K. E. Co. to friends and family. Thank you so much. We have stayed at this Outrigger property 4 times, our first in B404. We like the location as it is as close to centered on the island for our needs. Pool and gardens are great. The exterior of the building is showing its age although we heard the HOA committee is working on that. We came thinking we might buy a unit this trip but opted not to. I will stay here again as we love the island. The facility was very nice,clean in a beautiful location.The beds were very comfortable. However,we could not seat 4at the table for ears, or to play cards,and the lighting was not good for cards. The kitchen was well equipped. It was very difficult to open the freezer door. Wonderful location on the property! We had 14 amazing days in this condo. The location was perfect. We had an ocean view but still could view the beautiful pool area. The lanai was quiet from the trade winds so was useable anytime or night. The kitchen is well equipped & lovely also. The beds were very comfortable & we could unpack into the dresser. The bathrooms were perfectly equipped. I would not hesitate to rent this one again. We stayed at Waipouli Beach Resort. We were in a two bedroom unit with a view of the ocean and the pool area. We loved the location and we stayed on the 4th floor which gives a better view. We were close to the bike/walk path and grocery shopping was across the street. It was centrally located on the island which was nice when we went for drives. Wonderful vacation. Perfect setup for 2 couples with infants. Loved our stay at the waipouli resort! The pool was absolutely perfect! The condo was clean and included everything we needed for cooking, doing laundry etc. 3 balconies with ocean views! Couldn't imagine a better place to stay for our week in Kauai! Fantastic, great location and beautiful property best vacation ever. Our vacation was wonderful. Unit B404 was everything we needed and more. 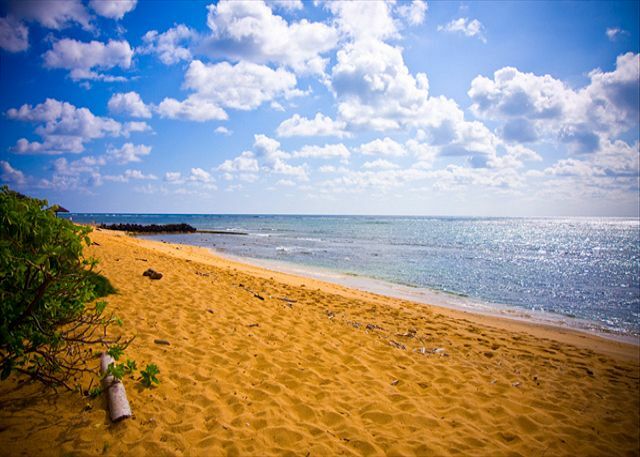 The property is in a perfect ocean front setting and very family friendly. The water slides were enjoyed by all! The gates codes to get in to the pool area were complex and it stalled most everyone trying to get in. There didn't seem to be enough lounge chairs at the pool for the amount of people. The landscaping personnel should be scheduled at different times, they would cut trees right over the top of people and make a mess in the hot tub the people were sitting in, better planning on managements part needed. The condo was in great shape and perfectly located between the South and North shores. So convenient to have grocery options across the street. Perfect vacation rental! This condo was one of the best places and experiences I have had as long as I have been renting for vacations. It was a good location and even though the street it is located on is quite busy the resort itself was quite and comfortable. The condo itself had all the comforts of home and extras to enjoy a hassle free day at the beach. I would not hesitate to stay here again. We spent 4 days at the Waipouli Beach Resort and had a wonderful vacation! 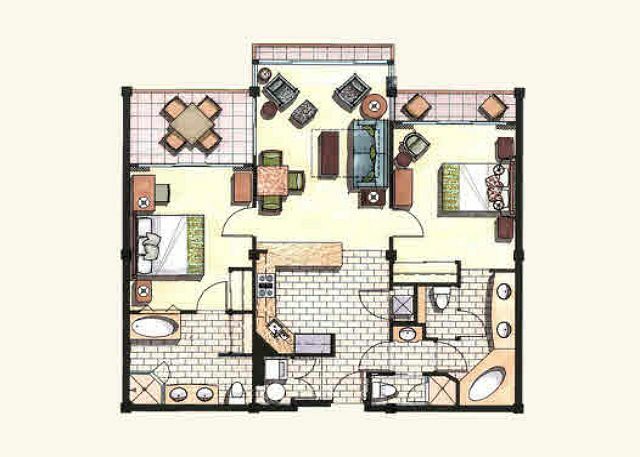 The condo was perfect for our family of 4 with the two separate bedrooms with 2 king beds. Beautiful view of the pool area with the ocean in the background. We were not too impressed with the restaurant The Oasis so opted to use our kitchen or ate at restaurants around the area. Loved that the condos had everything from washer/dryer to blow dryers to a full kitchen. 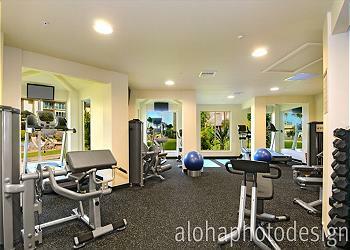 Very nice unit, spacious with great views of ocean and whole pool area. Good quality furniture and amenities. 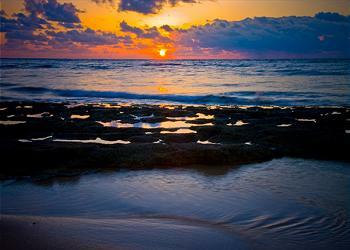 We just recently stayed in the Waipouli Beach resort and had a fantastic time. The apartment has a great location easy accessible from the airport with easy drives to the North or South shore. 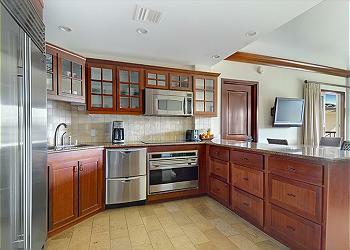 All the equipment in the kitchen is of highest quality + absolutely clean and bedrooms and bathrooms are just perfect. Pool and other facilities around the apartment are great and safe for kids and both of our sons enjoyed every minute in this surrounding. Shopping is available just across the street and for special day trips you get great advise and tour bookings by the concierge in the lobby. Compliments to the management team of this apartment -- you did a fantastic job in all mail communication to book this apartment and also to the kind support team on spot making this holiday an absolutely fantastic experience. The room was perfect. Everything was in working order, clean and exceeded expectations. My family and I thoroughly enjoyed the stay. Would stay here again. We were visiting Kauai with neighbors from Colorado and had a wonderful trip. Loved the Oasis restaurant on the property - convenient and delicious - pools and hot tubs were spectacular - and with the ocean a few steps away - how could you go wrong? ***** star rating all around! What a beautiful place! We really enjoyed our stay at Waipouli and would go back in a heartbeat. What we liked: location near Kapaa was great - a short drive from everything. 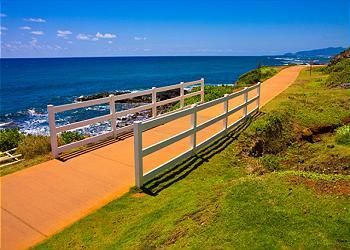 Great running trail just north of the hotel along the ocean. Layout of the condo was perfect for our family of four. Kitchen was perfect - well stocked for all our needs. Laundry came in handy. High speed internet worked perfectly. Very quiet - we didn't hear any other guests. Concierge was very nice and helpful with great recommendations prior to the trip. What we didn't like: Pools were FREEZING cold. Totally unusable. There was one kiddie hot tub but it was too small and crowded. The ocean was warmer than these pools!! The master bath shower stall was grimy and dingy. Could use some significant cleanup. Our adult family of 5 had a wonderful stay at Waipouli Beach Resort B404. We don't often get the chance for vacations now with all 5 of us, so we were hoping for a great week together. 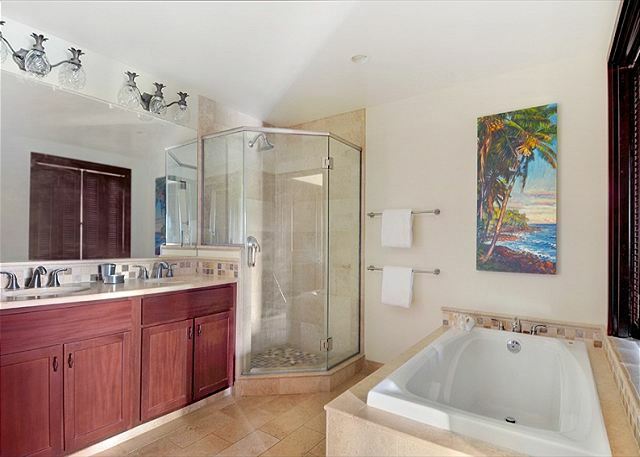 This condo was perfect -- spacious enough for 5 adults, very comfortable, upscale throughout, and located halfway between the attractions of the north and south sides of the island. The pool area is fantastic. We ended up having the wonderful vacation we all wanted. We'd all go back in a heartbeat. We had a wonderful time at the Waipouli Beach Resort. The room was clean and equipped with everything we needed. We stayed 11 days and it was fabulous! The view was gorgeous and the staff was very helpful. We had a wonderful 25th anniversary trip! My family and I had a wonderful time at the Waipouli Beach Resort. The unit was very well appointed as far as equipment was concerned - cookware, beach chairs, umbrella, and even 1 set of snorkels & fins. The management people were all very nice and available whenever we had issues e.g. air conditioning unit didn't start up - so we texted a number as advised and received a phone call in less than 5 mins. Just a warning to future guests - make sure you stop off at Safeway across the street to pick coffee, sugar, etc. before calling it a night. Also beware the "towel-nazi" at the pool. Just bring the beach towels that are supplied. Feel like you have money for a pampering vacation even when you're a budget traveler! The unit was just as described and even exceed the expectations of our guests. 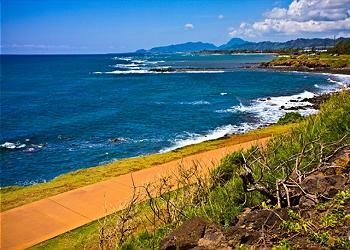 Already recommended to several people that are planning trips to Hawaii. Josh and company were very accommodating and made the whole process easier than any company we have booked through. Mahalo! 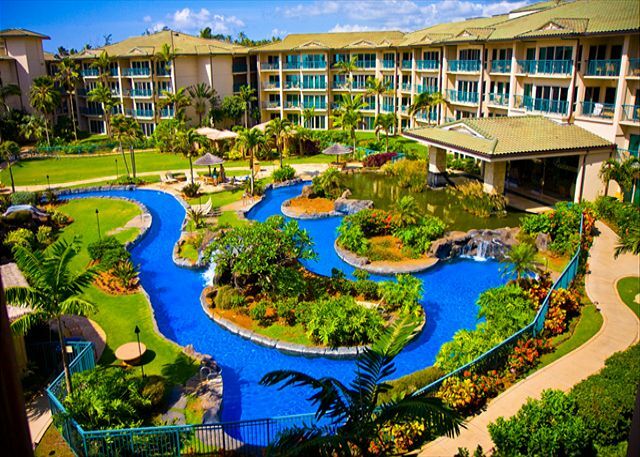 The resort size was great not to big and easy to get around, great location,everything you needed in a condo! 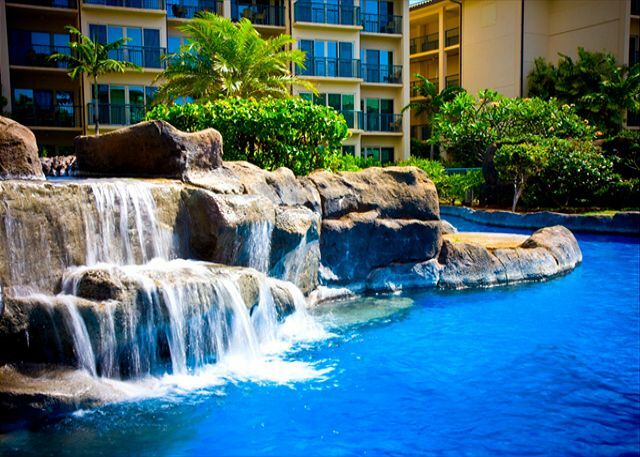 We love staying at the Waipouli Beach Resort. 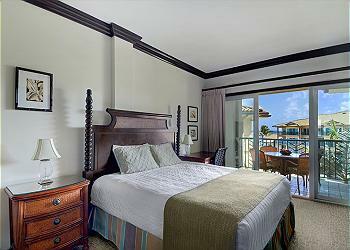 The rooms are gorgeous with both ocean and pool views. I really liked the conveniences of the appliances in the room as it has a complete kitchen as well as washer and drier. This room comes with 2 master suites and the beds + pillows are so soft and comfortable. There's plenty of room. It has a modern design but you feel completely at home. The resort is family friendly. There is a humongous salt water pool that has 2 water slides, several water falls, a grotto, 2 jacuzzis, 1 kids jacuzzi, and a kids shallow sand bottom pool. Josh from Kauai Exclusive Management was very friendly and accommodating. I wish all resorts were like this. We had a great 2 bedroom apartment with the MOST comfortable bed I have ever slept in. The view was great and the kids loved the pool. Restaurant was really nice too. The only issue I had was that our room was close to the kitchen area and there was constant noise from the building while the restaurant was open apart from that it was lovely and if we ever make it back to Kauai we will be staying here again but in an apartment on the other side of the pool area . 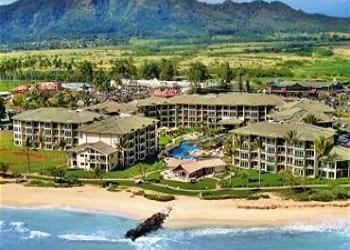 KAUAI EXCLUSIVE DELIVERED THE EXACT LUXURY UNIT YOU SEE ONLINE ONLY BETTER!!! EVERYTHING YOU NEED FROM SNORKEL GEAR & BEACH CHAIRS, COOLER & UMBRELLA, EXTRA TOWELS, EVERYTHING YOU CAN THINK OF RIGHT DOWWN TO COOKING EXTRAS LIKE TO SALT & PEPPER YOU DONT WANT TO BUY FOR THE ODD COOKING. THE CHECK-IN PROCESS,INTERNET CONNECTION, COMFY BEDS & GREAT VIEWS MAKE FOR A REALLY FANTASTIC ALL ROUND EXPERIENCE. WOULD DEFINITELY STAY HERE AGAIN. We LOVED our stay at the Waipouli Beach resort - it was a perfect for our family. I was so pleased with everything I would be back in heart-beat. We were in B404 and I would rent this exact room again. The management company was very helpful too on our last day and worked with us on a late check out for a small additional fee. 5 stars! We were so fortunate to find this luxury condo at the last minute and the Management team was extremely helpful in getting us settled late in the day. 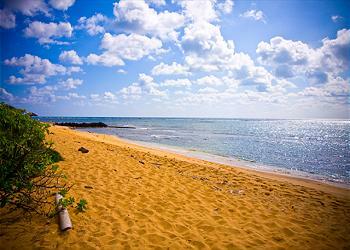 The location on the beach in Kapa'a is a perfect base for all island sightseeing. Our grandkids loved the pool & waterslides while the adults enjoyed the hot tubs. The kitchen, baths, & central A/C are the big pluses here--and don't forget the fabulous icemaker in the Sub Zero. This is upscale all the way and close to stores and restaurants. The Oasis restaurant on property is a treat on the beach. This condo overlooked the pool and ocean, was quiet and very well maintained. Can't wait to go back. We've stayed in a lot of condos in a lot of places and this Management company is the most accomodating and pleasant to work with of any. Loved it!!! Not only did we fall in love with Kauai but Waipouli Beach Resort was the perfect place to call home for the week. It was heaven to come home to our condo at the end of a long day of exploring. The hot tub and pool were just what we needed. We also loved that there were many other families staying there too so both the adults and kids were able to make friends and share stories about their adventures. The kitchen made it easy for us to make many of our own meals with goods we found at the farmers markets. We appreciated the generous sized rooms and the cleanliness of the condo. We will definitely be coming again and in the meantime will be telling our friends and family about it! 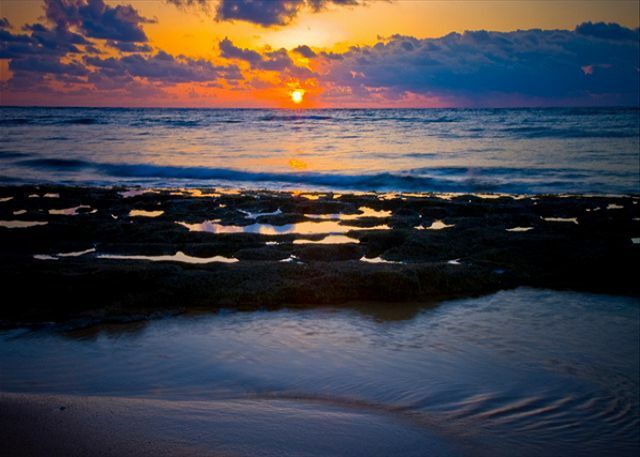 Perfect place to stay for covering all the island of Kauai has to offer! Our stay at Waipouli was top notch. Great unit (B404) which has a wonderful view of the ocean and the entire pool area. Dishwasher didn't work and when we told the management company, they took action to immediately fix the situation - a new dishwasher was installed -- AND -- they gave us a dinner gift certificate at the restaurant - which I thought was very guest oriented. The unit had a cooler, beach chairs, a beach umbrella which we used often. Overall, the complex is quiet, well built, clean. The pools and hot tubs (3 of them) were exquisite. All 'n all, a great place. 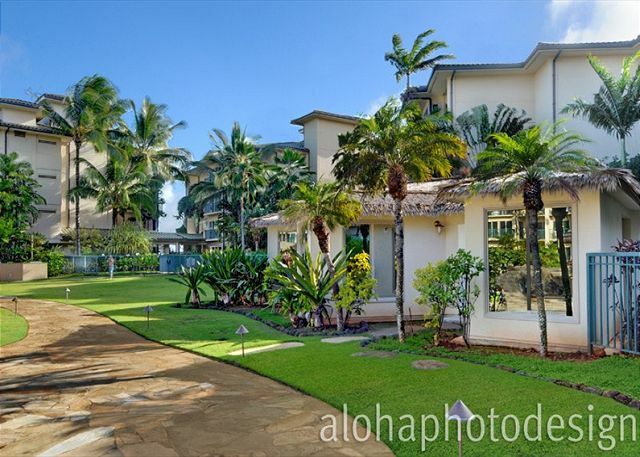 You really can't go wrong with Kauai Exclusive - and our man Josh was exceptional in the attention he provided at time of booking, and all the way through. 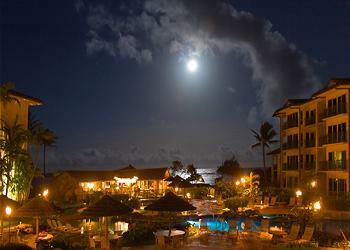 The Waipouli Beach Resort was a great experience. It is in a great location, clean, and beautify! 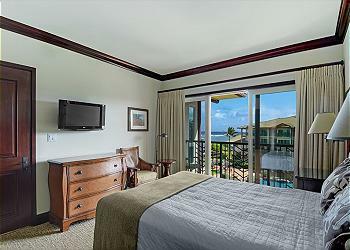 WBR on Kauai's east side is the ideal place to stay! 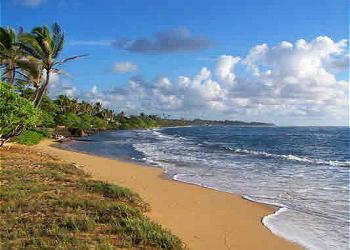 We very much enjoyed the WBR, especially our B404 unit and being on Kauai's east coast. 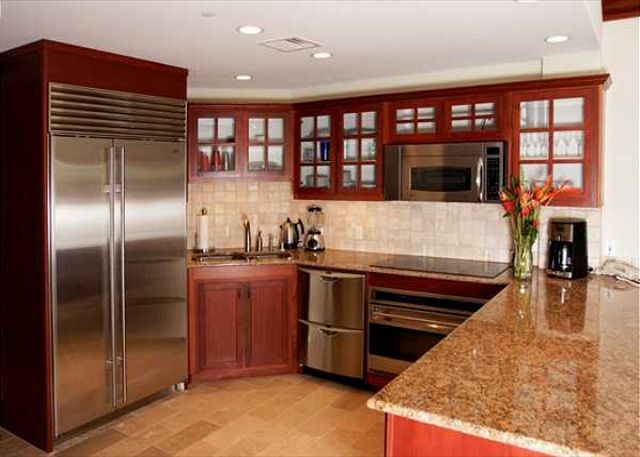 The unit was absolutely gorgeous with high end granite, appliances, fixtures, etc. More of an oceanview than oceanfront room, but still a nice view. Nice family atmostphere at the pool, but not overrun with kids. Nice beach. Really enjoyed the 5 mile walking/running/biking path 5 minutes north...million dollar views at every turn. Also nice having grocery stores very close, and nice that all varieties adult beverages are sold there. The town Kapa'a has the feel of a laid back fishing village rather than a tourist area which we liked. It was literally 20 minutes max to drive to Princeville to the north or Po'ipu to the south, so excellent location. These accommodations at either place would've easily been twice the cost there. The managment company who helped book trip was also very professional and helpful. Overall had an awesome trip, and recommend the WBR highly! Spacious and beautiful condo, was a bit noisy when kids were playing in the pool during the day. Definitely recommended. The resort was beautiful and well taken care of. The room was amazing. We enjoyed the pool and the staff was very nice.